Ready to see Drug Addiction in a Whole New Way? 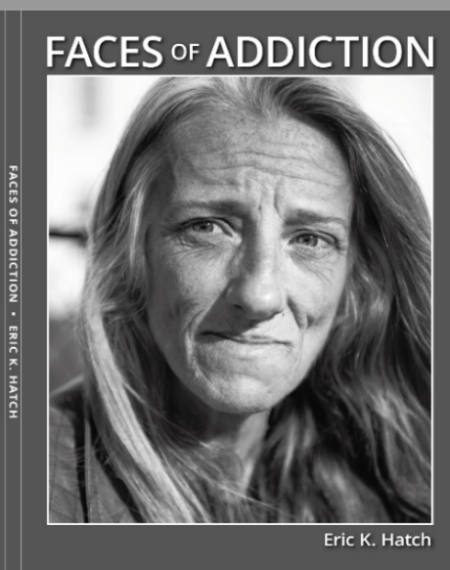 The Faces of Addiction book duplicates the gallery show. You will see the same stories and photos in a physical format. Extra materials discuss how the project started and lessons learned about the nature of addiction. The book is 124 pages, and it is available now through the button below and by April 25th through booksellers nationwide. Note: These stories are extracted from recorded interviews with the portrait volunteers. They are their stories and are not fact-checked or verified. Not everything said may be truthful, and very little is verifiable. But the pain these brave people face is real. Read at your own risk. "Eric Hatch presents his subjects with compassion and humanity, while showing us the great tragedy of lives overtaken by substance abuse. The visually stunning photographs along with their heart wrenching stories create a compelling book of great importance." Prices shown reflect discounts for more than 5 books; the tenth book is free. Contact us to learn more about higher volume book purchases for your school, church, or organization. As our national drug crisis rages unabated, initiatives such as Faces of Addiction take on added importance and urgency. The opioid epidemic continues to ravage every region of the United States, and every demographic of our population. In 2016 and 2017 combined, 139,000 Americans died of a drug overdose, the shocking numbers fueled by the rise of synthetic opioids. Addiction is a problem so painful that most of us block it out or dismiss addicts as homeless “deplorables” or worse. Enter Faces of Addiction. Eric Hatch gives this problem a human face and tells human stories that we cannot ignore. Hatch’s book and his photographs are powerful, compelling, heartbreaking, vexatious. His summary section, “What I’ve Learned About Addiction,” includes essential and revealing information about what addiction is, and who addicts are. The portraits of the addicts – our fellow human beings – and their stories speak to the shadow of a truth that resides in all of us: there, but for the grace of God, go I. This project arrives at a critical and propitious juncture, and may well help to hasten the end of this deadly American scourge. Opioid addiction is more than a social problem; it is a humanitarian crisis. Photographer Eric Hatch has combined powerful images with true stories from his subjects, all volunteers, by the way. The result is a book that will draw you into their world and make you realize that but for the grace of God, this handful of folks could be a neighbor, a family member, or even ourselves. Yet, within these narratives, there is a ray of hope. Many of Hatch's portrait subjects have found their way through treatment programs and are fighting to regain the lives they lost. Powerful images and heartbreaking stories. By focusing on the individuals rather than their surrounding conditions, Eric Hatch's portraits and biographies have sent a compelling message. The opioid epidemic is not about weakness or lack of character, it's about the loss of hope. And it clearly won't be solved with draconian measures like throwing these people in jail or by stern admonitions to "just say no." A picture is still worth a thousand words -- and all of these are -- but Eric Hatch has distilled them all down to one simple sentence: We have to do something about this. Prepare yourself for an awakening. In the end, this is a transforming piece of work… In many ways Faces belongs to the literature of witness, but in a far deeper sense it belongs to the literature of hope. Eric Hatch’s recent book is a remarkable achievement that could help lead the nation toward a new understanding of our national crisis of drug addiction and lives tragically cut short. Although it has been years since we reached a national consensus that this crisis deserves attention and support from all levels of our community, it continues to escalate, the death rate from overdose continues to rise. It would be difficult today to find anyone whose circle of family and friends has not been touched by addiction. Mr. Hatch's photos and bios of individual addicts reveal them as people who could well be our family members, friends or neighbors. The portraits can help us understand that these people are not strangers we can ignore, but recognizable individuals, their humanity intact. The simple bios in the addicts’ own words let us glimpse their lives, filled with hope and despair. The stunningly beautiful photos provide an intimate, affecting portrait of each person. This book succeeds on many levels—as a beautiful work of photography, a poignant commentary on the tragedy of addiction, and a beginning step in changing our national perception of the addict.